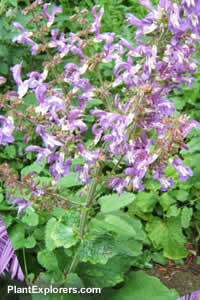 Bright mauve-blue flowers with distinctive white eyes are produced in profusion in the summer and early autumn. This semi-evergreen, bushy perennial is an excellent choice for planting at the edge of a pond, steam, or in the light shade of a woodland garden. Height and spread to 3 feet. For maximum freshness, please keep seed refrigerated in its original packaging until it is time to plant. Sow seed in containers in a coldframe in spring. Grow on in any moderately fertile moist soil.